This wonderful stew was hearty and healthy. The flavors in the dish were brightened with lemon zest and juice. I also loved that the roasted eggplant was seasoned with crushed coriander seeds- it made it a more special topping. The recipe was adapted from The New York Times, contributed by Yewande Komolafe. I doubled the recipe, increased the garlic and eggplant, decreased the oil, and used green lentils and feta cheese. Excellent. In a large bowl, toss the eggplant with 1/4 cup olive oil and crushed coriander seeds until coated; season with salt and pepper. Arrange in an even layer on 2 parchment paper-lined large rimmed baking sheets and roast until eggplant is tender and golden brown, 25 to 30 minutes, giving the baking sheet a shake halfway through roasting to toss the eggplant pieces for even cooking. In a large stock pot, heat the remaining 4 tablespoons oil over medium. (I used a large enameled cast iron pot.) Add the carrot, onion and celery. Season with salt and pepper. Cook, stirring frequently, until vegetables are softened, about 3 minutes. Stir in the orzo and cook until softened, 8 to 10 minutes. Remove from heat and stir in the lemon zest and juice. Top with the roasted eggplant pieces and crumbled feta or large shavings of ricotta salata. Serve with lemon wedges for squeezing, as desired. I love a recipe that gobbles up the greens from my CSA share. I have made this dish a couple of times using whatever combination of greens I had available. Recently, I used turnip greens, kale and spinach but I have also used chard and baby collard greens in the past. The classic combination of basil, tomatoes, and mozzarella was a nice complement to the sautéed greens as well. This quick dish was adapted from a Food and Wine staff favorite recipe, contributed by Marcie Turney. I doubled the recipe, decreased the red pepper flakes, and increased amount of fresh mozzarella. SO delicious. In a large pot of boiling salted water, cook the orecchiette until al dente. Drain, reserving 1 cup of the cooking water. Meanwhile, in a medium, deep skillet, heat 1/4 inch of vegetable oil until shimmering. Add the chickpeas and cook over high heat until crisp, 4 minutes. Transfer them to a paper towel–lined plate, sprinkle with the cumin and coriander and season with salt and black pepper. Discard the oil and wipe out the skillet. Add the olive oil, garlic and crushed red pepper to the skillet. Cook over moderately high heat until fragrant, 30 seconds. Add the tomatoes and cook until softened, 3 minutes. Add the greens and cook, stirring, until wilted, 5 minutes. Season with salt and black pepper. Add the pasta and 1/2 cup of reserved cooking water to the skillet and cook over moderate heat, stirring until incorporated. Add the mozzarella and basil and toss. Add more pasta water, if necessary. Spoon the pasta into bowls, sprinkle with the chickpeas and serve. My husband usually rejects any soup suggestion unless it has a stew-like consistency. I think I convinced him that this brothy soup would be great because of the bacon. 🙂 By the way, of course, he enjoyed it! Heat the olive oil in the soup pot. Add the onion, carrot and celery and cook over moderate heat, stirring occasionally, until the vegetables are softened, about 8 minutes. Stir in the garlic, bay leaf and 1 teaspoon each of the chopped thyme and rosemary and cook until fragrant, about 2 minutes. Add the drained beans, stock and 3 tablespoons of the reserved bacon fat and bring to a boil. Simmer the soup over moderately low heat until the beans are tender, about 1 1/2 hours. Discard the bay leaf and stir in the remaining thyme and rosemary. Season the soup with salt and pepper and transfer to shallow bowls. Garnish the soup with the bacon and serve. Note: The soup and bacon can be refrigerated separately for up to 3 days. Recrisp the bacon before serving. My son and I are huge empanada fans. (Now we’ve roped my husband in too!) So, last year we started the tradition of eating empanadas on Super Bowl Sunday. (With our guacamole, of course!) After seeing this version at Fiesta Friday, I knew I would have to choose this filling for one of our empanadas this year. They looked amazing. The filling recipe was adapted from Bourbon and Brown Sugar Blog. I used a large shallot instead of the onion, added garlic to the filling, and chilled the empanadas prior to baking. I also made homemade whole wheat empanada dough and modified the baking temperature and time. The dough recipe was adapted from Carla’s Comfort Foods: Favorite Dishes from Around the World by Carla Hall with Genevieve Ko. I cut the dough into 5-inch rounds as they were our main course; 3-inch rounds would be a perfect appetizer size. Yummy! Fry pancetta until it begins to crisp up. Using the pancetta drippings left in the bottom of the pan, sauté the jalapenos, red peppers and onions on low heat about 10-12 minutes (the onions should be translucent). Add the white beans, and take off the heat. Add the crumbled queso fresco. 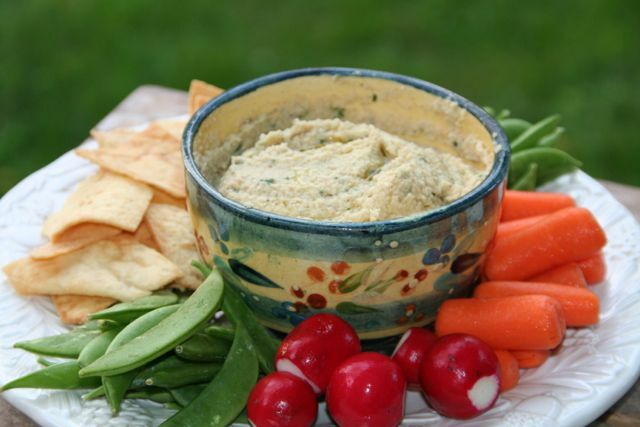 I made this dip as a hummus alternative. It was tasty– but we all prefer hummus! 🙂 This recipe was adapted from Everyday Food. I added hot chicken stock to the cauliflower and bean puree to make the consistency more creamy. I also added parsley, spices, and additional lemon juice to give the dip more zesty flavor. We ate it with veggies and pita chips but it would be good as a sandwich spread as well. Preheat oven to 375 degrees. On a rimmed baking sheet, toss cauliflower and garlic with 2 tablespoons oil; season with salt and pepper. Roast until cauliflower is tender and browned, 25 to 30 minutes. When garlic is cool enough to handle, remove peel. In a food processor, combine cauliflower, garlic, beans, 1 tablespoon oil, lemon zest and juice, and 1/2 to 3/4 cups hot stock, until desired consistency is achieved. Process until smooth. Add parsley and spices; season to taste with salt and pepper. (To store, refrigerate in an airtight container, up to 3 days.) Serve drizzled with oil.